Exfoliation should be a part of every skincare regimen. I have had scrubbing sessions since I have started my wellness journey with Whipped Salon. I love the fact that body scrubbing takes away all my dead skin to uncover a new layer of skin underneath that I have commercially available exfoliants at home. This is before I learned about using salt and sugar scrubs. The natural granules of sugar and salt make excellent body scrubs. Now, which type to use depends on different skin conditions and characteristics. The sharp angles of sea salt granules make them a strong exfoliant. Being more abrasive helps it do a better job at smoothing dryer areas of your body – feet, elbows, knuckles and legs. Sea salt helps draw toxins out of the body and is known for its anti-inflammatory properties that are good for sore muscles. .Upon trying sugar scrubs at Whipped, I find it gentler since sugar granules are rounder than salt granules. It diesn't “cut” my skin, and so it is a better choice for my sensitive skin. Sugar scrubs do make a gentle exfoliant that is suitable for all skin types and conditions in general. Whipped uses brown sugar with finer granules for scrubbing, which harness the power of natural, nutrient-based exfoliation to leave your skin glowing. After my Caramel Scrubbin' session at Whipped Salon, my rejuvenated felt smooth to touch. 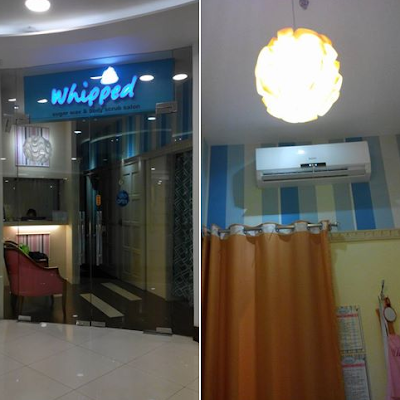 Do visit Whipped Salon branches to unveil your happy, glowing skin at : 3rd Floor, Ayala Fairview Terraces, Eight Forbes Town Center and soon at the Avida Southpark in Alabang. Follow @whippedsalonph on Instagram for updates and promotions.